Fatigue busting with the Wahls diet! I just made Tuna Pasta Bake for my kids, from scratch, on my own! Big deal, I hear some people say, but for me this is huge! I haven’t cooked a meal for my kids like that for 2 years! Usually I ‘assemble’ things or reheat things The husband has already made so I am very proud of myself! Come to think of it, I made scrambled eggs and toast for tea yesterday too! The most surprising thing is feeling inclined to want to! Anyone who suffers with fatigue will know the feeling of having lead weights attached to your ankles any time you want to walk anywhere. Or the feeling that lifting your hand to hold a phone or a book is impossible. This is why cooking from scratch can be so difficult for people with MS. When I’m on my own with the children I know I have to prepare food for them so I do but the effort is often enormous. 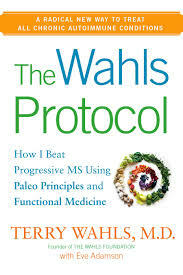 I’ve been, very loosely, following the principles of the Wahls Protocol Diet (The Wahls Protocol, Terry Wahls, MD) after hearing about it on twitter. I’ve been interested in nutrition since going on a diet after Christmas and I’d already cut out gluten and dairy as I’d heard these were not good foods for MSers. I didn’t realise, however, that there are loads of foods that are nutrient dense that can heal your cells and that eating more of those foods should have a healing effect. Our cells need certain vitamins and minerals in order to function so it makes sense that eating better may improve the function of the cells. The Wahls Protocol goes into great detail about these foods so I’ll leave it up to you to look into it but the fact that I feel so “normal” after following it loosely for 2 weeks is really encouraging! There are 3 levels of the diet you can choose to follow depending on your circumstances and what’s realistic. I’d rejected following the diets too closely as I was worried about the impact it would have on my family. 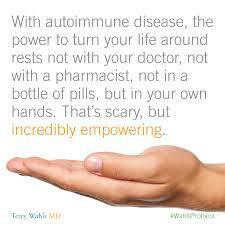 Instead, I followed some basic principles like increasing the amount of greens and colourful foods I ate. I have been eating grapes and oranges instead of apples, for example because they are more nutrient dense and these simple changes as well as being more strict about gluten and dairy have made a real difference. The Husband does all the cooking so it’s difficult for me to go on a strict diet but he will be amazed at my culinary efforts this morning and will encourage and support me as usual! I wrote a few weeks ago about the dreaded ‘time of the month’ and how my symptoms worsened during the week before my period. This has not happened this month! I think I will revisit the book later and get more strict with myself and will report findings in a week or 2! Have any other MSers followed diets? Any notable results?? ?